I wanted to make a bread for a recent gathering of friends. My preference was for something sweet but not a sticky, gooey kind of sweet. After paging through a number of books, I came across a recipe in Beth Hensperger's The Bread Bible for a sweet vanilla challah that sounded like it would fit the bill. The recipe called for just 1/2 cup of sugar in a two-loaf batch of bread, so it wasn't excessively sweet. The flavor, though, was driven by 1-1/2 tablespoons of vanilla extract in the dough and another teaspoon of vanilla extract in the glaze. How could it be anything but good? Combine the yeast, sugar, salt and 2 cups of the flour; mix by hand or by mixer. Add the hot water, eggs, oil, and vanilla. Beat hard until smooth. Add the remaining flour, 1/2 cup at a time. Continue beating until the dough is too stiff to stir. Turn out on a lightly floured surface and knead until soft and springy and a layer of blisters shows under the skin, about 4 minutes. (Note: I did not see any blisters forming, but kneaded until the dough was smooth and elastic.) The dough needs to be slightly firm for free-form loaves. Twenty minutes before baking, preheat the oven to 350F. To make the vanilla egg glaze, whisk together the egg yolk, vanilla and sugar in a small bowl. Beat until well blended. Gently brush the dough surfaces with a thick layer of the glaze. Place the baking sheet(s) on a rack in the center of the oven and bake 40-45 minutes, or until a deep, golden brown and the loaves sound hollow when tapped with your finger. Carefully lift the turbans off the baking sheet(s) with a spatula and transfer to cooling racks. Cool completely before slicing. Now, any bread smells good when it's baking. This bread's fragrance while baking is over the top; our whole house was perfumed with vanilla. The flavor is also marvelous. The crumb is fine-textured, smooth and moist. It's good all by itself, with a dab of butter, with jam or marmalade, and toasted. It will never last long enough to go stale, but it would make a wonderful base for either French toast or bread pudding. The results were every bit as good as I had anticipated and a big hit with my friends. just when you think it is safe !!! Do try it. It will be a delightful addition to your challah repertoire. It's also super easy to shape, compared to a braided challah. Whereabouts in Alabama? We lived just outside of Birmingham, in Shelby County, from 1988 to 1992. Our subdivision was a little south or the 288/119 intersection, not far from Oak Mountain State Park. I wish we still had access to a food co-op. We belonged to one in Michigan, prior to moving to Alabama. Food quality was excellent and the prices were unbeatable. The mantra at a lot of the ordering meetings was "It freezes well" when we were trying to reach the required unit quantity for a particular food. I am in Opelika but spend a fair amount of time running and biking in Oak Mt. I love that park. Great cabins and the trails are simply awesome. Funny about the food coops. We were in one in Chapel Hill NC in the 70's. Then when we moved to Auburn I ran one there for 8 years . This was in the late 70's early 80's. I had an 18 wheeler that delivered food to my garage. We had a lot of families and we ordered once a month. We started with Magnolia Warehouse and ended up with Ozark. We had a nice set up. An extra fridge out there and huge cheese knives, a honey gate for the 60# cans. We used to get our raw milk cheddar and swiss in 30# blocks. I remember well the "bargaining"....if you will get part of this 30# box of raisins I will get part of that 50# bag of ww flour....lots of fun ! What a nice memory you have brought me. Does living in Opelika automatically make you a Auburn fan? If you are that well acquainted with Oak Mountain (and I agree that it is a beautiful park), then perhaps you have also picked peaches in Chilton County. Or maybe climbed Mt. Cheaha. Or gone to the craft fairs at Horse Pens 40. Prior to moving to Alabama, we lived in Jackson, MI. My wife and I are both from farther north, in the vicinity of Traverse City. We currently live in a Kansas City suburb, on the Kansas side of the state line. I'd love to locate another co-op in this area. The only ones I'm acquainted with here are store-front operations, rather than the informal ordering and distribution type that I knew back in Michigan, which sounds a lot like your experience. Whole wheat pasta, cheese with no colorings, trail mix, yogurt, nuts, seeds, flours--it was great. 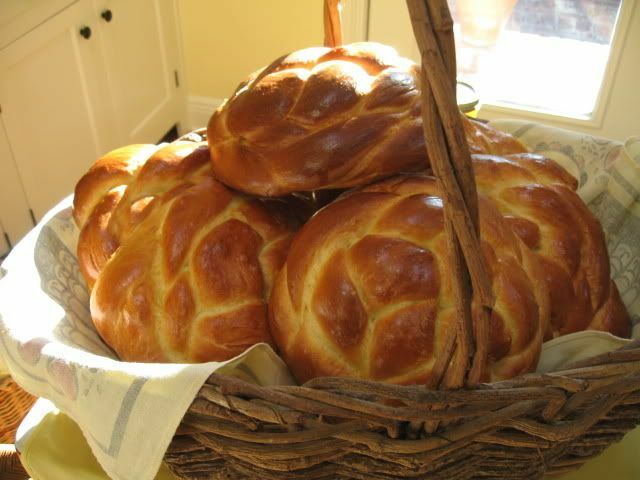 BTW, your round, braided challot are absolutely lovely. I noticed you lived in my home town of Jackson Michigan. Don't often see a refrence to Jackson except for David Stockton the former Secy of Treasury if I recall. The vanilla smells great, thanks! We love French toast here so I'll give it a try. I know we traded notes about our Michigan backgrounds some time back, but I didn't remember you mentioning that you grew up in Jackson. We lived there from 1978-88, after I graduated from MTU. I worked for a local engineering firm, Gilbert/Commonwealth. It was a really nice community for raising a family. Sadly, it was in a decline even then. I can't imagine what it must be like now with the economic problems Michigan has been faced with for the past several years. Let me know how the French toast turns out. This is such a pretty display of your loaves!! They look so yummy! Im wondering why you haven't posted your lovely photos in the/your blog on TFL...it comes in handy! Those look wonderful! I am SO going to make these. Thanks for sharing the recipe. Paul, Very Nice looking Challah! Wish I had a slice with my tea this morning! One of my favorite things is the different forms/shapes of bread and yours is lovely... I enjoy many of Beth Hensperger's recipes and have a few on my to do list...I have been out of town and looking forward to baking again! Thank you for the recipe! I have a question!! I always hesitate to post a recipe from bread books...but is it OK from 'any' bread book? for your compliments. I hope you enjoy the challah when you get around to making it. Regarding the copyright question, here's a thread from a while back that discussed that issue. I try to be careful to credit both the source and the author, in the hope that it might steer someone toward buying the book for their own library. If you do happen to compare what I have written with the recipe as presented in Ms. Hensperger's book, you will see that I have taken one small liberty with the ingredient list and a number of substantial liberties with the write-up describing the process, including some commentary of my own. I have no wish to run afoul of the copyright police, nor do I want to deprive an author of his or her rightful gains from their intellectual property. You'll notice that there wasn't a direct response to your question in the above, because I'm not well-enough versed in the law to offer an informed opinion. I made this last Thursday. They were so good. My kids loved it! I found that this dough held its shape better than most challah doughs I make. (and I make a lot) I made three smallish loaves, a round, a braid, and a panned twist. They also browned much more - probably from the sugar in the glaze. Thanks for the recipe, I'll definitely be making these again. I'm glad to hear that the challah turned out well and that your family enjoyed it. These are on my "to be baked again" list, as well. In the column at the left side of the screen, just underneath your login, there is a list of items, beginning with Messages. The third item in the list is Create Content. Click on that. A new page will open, giving you the choice of creating a blog entry, or a new forum entry. Click on the one that suits your preference, and you will be taken to a page containing a text editor, where you can type out your latest baking escapade, questions, or whatever. OMG those look incredible! I can't wait to try it. 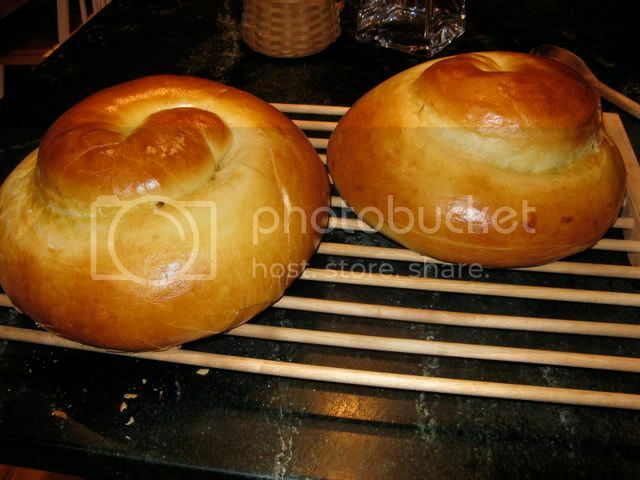 Do you have any problems with the centers of your round challahs getting cooked through? I have had that problem in the past with raw dough in the center of my round challahs, so I'm always leery of that shape. Any hints for insuring doneness in the center without over-browning the crust? I haven't had a problem with undercooked centers, so far. Because the two baking sheets filled up a rack, I used the convection setting on my oven to bake these. (That's called learning from previous experiences.) I noticed that the side facing the fan was browning faster than the side facing the door, so I rotated them part way through baking to avoid two-tone crusts. I'm not sure if that may have contributed to more even baking of the exterior/interior, or not. This particular batch came out with a pleasantly moist crumb. Challah has a reputation for drying during baking, so I'm not quite sure what to attribute that to. Maybe the oil? I did attempt to not work a lot of additional flour into the dough during kneading. I hope you enjoy it when you make it. Paul, those are beautiful challah! We too live in Alabama and enjoy baking challah. It is cool to find out that you and trailrunner are my Fresh Loaf "neighbors". I live half way between Auburn and Talladega. We do a lot of shopping in both Auburn and Birmingham. Both are beautiful. Small world. I always enjoy your baking Paul. Have a great weekend. We enjoyed living in Alabama. It won't be long now before the dogwood, hydrangea and azalea begin to bloom, will it? This yankee never did quite adjust to the notion of planting pansies in December, I must confess. If you had been here this past weekend, you would have been less impressed with my other baking attempt. I had made up a sourdough pain de compagne that had every appearance of being a real winner. It smelled absolutely wonderful in the oven. Until, at least, it got past the intended time to come out of the oven. But, I was busy playing with my grandson and never heard the timer go off. It was only when I began to realize that I was smelling a scorched odor that I snatched the bread out of the oven. By then, it past being "boldly baked". What a shame! The crumb texture was more open than any I have achieved recently, and still moist. Sadly, the flavor was not what it should have / could have been. I've been eating it anyway, because it is good bread, but it's still scorched. Ah, well, better luck next time. And, better a neglected bread than a neglected grandchild. What a wonderful loaf..the perfume of the vanilla in your home and then the pleasure of savoring the flavor. Wow! A real keeper, for sure. You did an excellent job shaping, they are just lovely.Thanks for sharing. I made the challah this weekend. I made one round braid, 3 small 4 strand braids, and a small "snail" which was our tasting bread. The family really loved the flavor (YAY! ), and the round braid was beautiful. The big round challah is beautiful! I hope it is done in the center--I misread the directions and only put it in for 35 minutes, it was out for about 5 minutes when I realized my blunder, and I put it back in for 15 additional minutes. It sounded hollow on the bottom both times I removed it from the oven, and I didn't dare leave it in any longer the second time because it was getting quite brown. Hopefully it will be done enough. It went in the freezer until Shabbat. Thanks for sharing this lovely recipe! I didn't use this recipe, but did bake Maggie Glezer's Breadsmith Challah, which calls for vanilla in a slightly-sweet challah dough. It smelled truly amazing, but my daughter walked in and shouted, joyfully, "cookies!" and was then crestfallen when it was bread. That was indeed the problem for us... the vanilla "nose" piques your tastebuds to expect something MUCH sweeter (dessertier) than challah. I'm a novice baker and all these posts & pictures encouraged me to try this recipe. Loved it! It turned out great and we ended up using one loaf for French Toast and the other for snacking. Thanks! 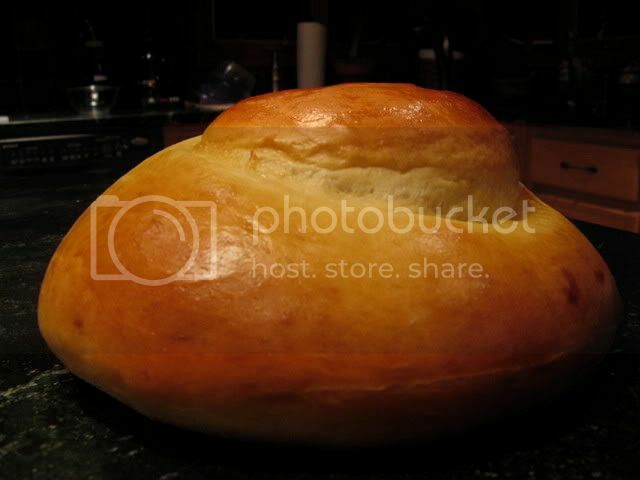 Very delectable looking Challah bread, i want to try it! Paul, what do you think about adding handful of soaked and drained raisins and replacing the oil with butter to the dough? How would it come out, and if i can change oil to butter how much should i use? For starters, I'd substitute equal quantities of butter for oil. Since butter has somewhere between 15 and 20% water, there might be a slight difference in dough texture but I doubt that anyone would complain. You can always adjust the next batch to suit your tastes. I hadn't thought about raisins but see no reason why they shouldn't be a great addition. Go for it! for your reply. I guess i'm going to add some raisins...maybe a handful...soaked in warm water and very well drained. But as for the butter, i think i'm going to stick to oil as your described since i want to know how the original recipe would come out like in terms of texture and taste. So last night i made it...I know that some of you...especially those experts in Challah might feel offended by the results, but i guess it wasn't so bad after all bearing in mind that i am still novice in baking and on the other hand this is my first Challah ever. I took PMCool's recipe which is Beth Hensperger's, but since i always wanted to know how to braid Challah i didn't go for the snail form, but rather made it following Maggie Glezer's six-strand braid. 1- I wanted to add 100 grs. of seedless white raisins to the dough, but i was coward in adding them to the ingredients from the beginning, so i delayed that till after bulk fermentaion, when i spread the dough into rectangle and sprinkled the raisins then roled the dough into a log. 2- Shaping: Due to the inconsistent behavior and unability to elongate the strands because of inclusion of raisins in the dough after the bulk fermentation, this resulted in two things: #1 inconsistent strands in terms of thikness, #2: unmanagability of obtaining the beautiful form of six-strand braid, as you can see in the picture. Also that fault resulted in tearing the strands in some parts, consequently not being able to rise as maybe it should. 3- Texture: Was somehow dense and not light and with no open crumb, yet it was soft and nice tasted. 4- Final Proof: I kept the braids waiting on the counter for approx. 45 mins. It rose considerably out and high (out because of the poor handling due to inconsistency in the thikness of the strands). But should i waited longer on them, i could have had more rise. 5- Oven Spring: As you can see, i had one really big six-strand braid and one three-strand small braid, that i erronously baked together at the same time. That resulted in two things: #1: i had considerably impressive oven spring, which led to #2: two braids sticking to one another and after being cooked i had to tear thema apart which caused another added defect in terms of shape. 6- Flavor: a- Adding butter equal only to 35% of the amount of oil the recipe calls for, gave a very rich flavor. So it was very nice. Being less than a stellar braider myself, I sympathize with your struggles. You made a good decision to incorporate the raisins after the bulk ferment, rather than in the initial mixing. The raisins, particularly if much softened by soaking, might not have retained their shape during mixing and kneading. Here's an idea to try: after rolling the dough out into a rectangle, cut it into the number of strips that your want to braid. Lay a row of raisins down the center of each strip, then fold the dough over the raisins and seal the seam to completely enclose them. Now you can roll the raisin-stuffed, sealed strips into ropes for braiding. If handled gently, the raisins should stay bundled inside; thereby making the rolling-out process simpler and protecting the raisins from drying during baking. The ropes will still be lumpy but you won't have to try to push the raisins back into place all of the time. I'm glad to hear that the butter substitution worked well. And yes, the aroma of this bread is amazing! The crumb texture in the photo looks somewhat coarser and wetter than I recall from my previous bakes of this bread; more cake-y. Did you allow the bread to cool all the way to room temperature before cutting it? If you cut it while it was still warm, that might explain some of what I'm seeing. If the bread was completely cooled before cutting, then it may have benefitted from a bit more flour in the dough, or more kneading, or a few minutes longer in the oven to fully bake out the excess moisture. Did you happen to measure the internal temperature of either loaf before removing it from the oven? Do give yourself a pat on the back for this first attempt. It is a success. What we are talking about now is making the next one even more successful. I want to thank you so much for this delicious recipe! My fifteen year old and I made it yesterday for Shabbat. We gave one loaf away and happily kept the other one. The vanilla scent is amazing! The flavor is delicious. The texture is fabulous. We also sprinkled the top with a little cinnamon sugar mixture in addition to the glaze. We baked ours in two loaf pans and they rose like the Eiffel Tower! Thanks a million! As much as this bread expands while baking, I can certainly picture some very tall loaves! And the sprinkle of cinnamon sugar can't have hurt the flavor any, either. If they last long enough, they make excellent french toast with, of course, a little vanilla in the egg mixture. PMCool, they were absolutely fabulous. i asked my daughter what she wanted for dinner tonight and she wanted French toast from this challah. This is after she made herself a Nutella sandwich out of it earlier in the day. Can we say CARB-FEST?! Wonderful recipe!